The PVC free patio heater cover is a worry-free solution to keeping your patio heater clean & protected from the elements. The all-season, weather-resistant top layer is designed to keep dirt, dust, & debris off your heater lounge, & the waterproof backing keeps it dry. At 27" wide, 76" deep, & 25" high, this protective cover fits many styles of patio heaters. To clean dirt or debris off the cover, simply wipe with a damp cloth. Operation Instructions 1). install the thermocouple tip on a board and use two nuts to fix it's location 2). Keep the tip at around 5mm distance from the burner hole in right height. 3). Faston the thermocouple nut M8 on the valve end tightly (Check if your valve end thread if 8mm before you buy) 4). Connect two flat terminals well with the current tilt switch terminals. 5). Open gas and push your valve around 5-10s till the thermocouple head is heated enough. 6). Release your hand and it work properly If when you release hand, gas valve shut off again, Please check a. 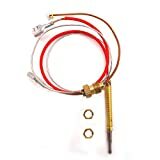 If your thermocouple is always be heated on flame b. If the thermocouple end is well connect with valve c. If the terminals connect tilt switch well. 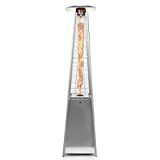 STYLISH, COMMERCIAL-QUALITY: Expertly crafted from premium, high-grade steel and aluminum, this professional-grade, 7' 6" tall outdoor propane gas heater with a dancing flame in a pyramid-style column produces both radiant warmth and exquisite beauty. Built-to-last with durable, weather-resistant components which include a rust, fade and corrosion-resistant finish, this heater is designed to withstand extreme climates, harsh sun, and abrasive salt air. ULTRA-EFFICIENT HEATING COVERAGE: Providing a comfortably wide field of warmth up to a 15' diameter, the heater's ceramic-glass heating column produces an extremely high, true-rated 38,000 BTU output, however, these heaters are sometimes quoted at their "peak output" of 42,000-45,000 BTU. SAFE & CERTIFIED: The heater features a built-in safety valve that will automatically shut off the fuel supply (shutting down the heater) if unit is tilted or tipped. It also includes protective mesh surrounding the ceramic-glass heating column, and a pilot light for safer startup/shutdown. It is also compliant with ANSI, CE, and CSA standards and specifications. TRANSPORTABLE: Includes wheels for convenient transport or storage. EASY ASSEMBLY & OPERATION: Heater features a simple push-button ignition for fast and simple operation, and a temperature control knob provides easy adjustability of both the height and intensity of the dancing flame. All accessories required for use are provided in the box, including a ceramic-glass heating element, heavy-duty propane gas regulator and a pre-attached flexible hose. Simply supply your own standard 20-pound propane tank and fuel. This Thermo Tiki deluxe pyramid-style outside patio heater is the ideal multi-purpose heater to create a warm, inviting ambiance. Unique, stylish design provides endless versatility and compliments any exterior décor, from personal home use to restaurants, pool parties, weddings, and more. 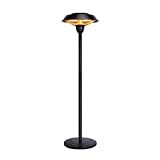 Featuring a beautiful glowing flame within a 4" diameter ceramic-glass column, this porch and deck heater is 7' 6" tall and provides a stunning display and radiant warmth up to a 15' diameter (exact heat range is dependent on the ambient temperature). The stable, anti-tip base of the heater conceals a full 20-pound propane tank (not included) and all the controls, for a sleek, modern exterior. Also features a safety shut-off valve and pilot lighter for safer startup/shutdown. Height: 7' 6". Reflector size: 18" square. Fuel type: Propane (also called LP or LPG). Run time: 10 hours typical with a standard 20-pound tank. Thermo Tiki is the premiere source for professional-grade outdoor patio and garden equipment that combines exceptional functionality with elegant design. Easy to Use: Provides instant, steady, quiet heating. Heats up to 12 sq.ft. Minimal set-up required with just a pull string switch. 5100 BTUs. Don't forget to check Amazon listings for our sister product. A perfect match, high-end, advanced series of electric tabletop heater (ASIN:B07L3CHSBH ). Safe to Touch: Safety auto shut-off in place for tip-over protection. Constructed with high-end materials and an anti-skid design on the heater base. This heater is stable and a functional addition to any space where you need a little more heat. It will turn off if tipped over. 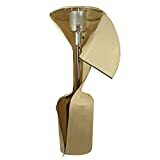 Newest Unique Designed Extras: Built to be portable and fashionable in a hammered bronze tone.This heater is perfect for outdoor decoration and function. Two adjustable height from 6.5 ft to 5 ft make this heater more user-friendly. Safe and Environmentally Friendly: This electric patio heater produces no odors, chemicals, or fumes. The high quality, infrared heating is hardly affected by wind. Industry leading halogen tube technology heats efficiently with a lifespan of up to 8000 hours. Certified and Warrantied: IP44 certified; weather and dust resistant for outdoor use. cSGSus Certified. Comes with a 1 Year Manufacturer Warranty. 1) Safer and cleaner to use. Does not output CO2 like propane or natural gas heaters that burn fossil fuels. 2) No dangerous tanks, no plumbing and no ventilation needed. 3) Mount horizontally or vertically. WHY SHOULD I CHOOSE AN INFRARED HEATER (ELECTRIC HEATER)? The heat warms objects over a wide area, which means you and your guests have a larger area in which you can stay warm in. The electric heater doesn't have a flame and it doesn't burn oxygen, making it much safer and a more suitable option to use indoors than heaters with real flames. Economical and environmentally friendly - Low running costs, calculated at just 18p per hour, approximately one third the cost of gas heating. 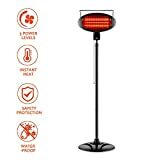 【INDOOR&OUTDOOR USE】With IPX4 rated, patio heater is designed to be assembled both indoor and outdoor freestanding use - perfect for home, BBQ areas, garages, outdoor patios or gardens, no worry of bad weather. 【CONTINOUS WARMTH】Once you turn on the heater, you'll be surrounded by instant warmth. The halogen heater uses electricity and does not output carbon dioxide, saving 30%-40% on electricity compared to a traditional heater. 【EASY OPERATION】Only partial assembling is required; adjustable height of standing pole, pull line switch makes the heater more user-friendly. The heater radiates heat with no odors, chemicals or fumes and warming the object or person in front of the heater rather than the front air. 【USER-FRIENDLY DESIGN】CE and ETL certificated, the heater is weather and dust proof and maintenance-free, adapting explosion-proof net and tip-over switch for safety. Inside 3 halogen fire tubes are efficient with a long life span about 5000-5500 hours. 【RELIABLE CUSTOMER SERVICE】Customer service responds within 24 hours; 30-day money pay back and 12-month manufacturer warranty. If you have any questions, please do not hesitate to contact us, we provide 100% service with our patio heater! Need an electric heater for your garden? Can't hold an outdoor party in cold winter? Feel chilly when smoking in your patio in the winter? The halogen heater contains 3 heating halogen tubes and high-rated heating system that provides heat evenly. Reflective heating technology replicates the sun's rays, producing no odors, chemicals or fumes and warming the object or person in front of the heater rather than the front air. The heat fliters UV rays and and protect your skin. The Brand New Outdoor Pyramid Heater is a unique pyramid design by Belleze. It's like a piece of art for your yard, it combines form with functionality and will accent any patio with its beautiful lines. The pagoda shaped top spreads a diamond pattern of warm fire light all across your entire patio. By simply turning the adjustment knob you can raise a column of flames that safety dances behind the mesh panels. Elegant feature with its Hammered Bronze design. With a few simple safety tips and precautions you can prevent most heating fires from happening.